Welcome, we are excited to announce our new Cuba apartment. Please relax and enjoy our lovely courtyard and our great looking furnishings. This apartment is a 2 minute walk to the top of Cuba street, which makes it the perfect location. This space is really private and quiet, so please make yourself feel at home. There is also free unlimited WiFi and a huge 58 inch TV. Please see my other listings for reviews. PLEASE NOTE: There is only 1 main bathroom with a shower, toilet etc, there is another .5 bathroom downstairs but only has a toilet and basin. It is pay parking along Torrens Terrace but not all the time. It only applies applies from Monday to Friday between 8am and 6pm. Even during this period the first two hours are free and no coupon is required. If you want to park longer than two hours you do need to buy a coupon which are available from local shops including the mini mart on the corner of Webb St and Torrens Terrace. We have a NO PARTY policy! Please treat this place like your own. Property was nice, however, a few minor points need attending to. We were unable to get Freeview channels in spite of contacting the owners, which was most disappointing as at the rate we were paying one expected everything to be perfect! The noisy ventilation in the lower bedroom could only be switched off by tripping a circuit breaker on the main switchboard. The upstairs bedroom needs bedside reading lamps as the only lighting available was the main quad lights. If one partner wanted to read the other one got the spotlight right in the eye. The info sheet should tell you where to get the parking permits (at the dairy down the road). Good points were the location, beds were comfy, kitchen was spotless, very little road noise. The appartement is clean and in a quiet place. We had everything we needed when we arrived. Fantastic location and apartment was spotlessly clean and comfortable. We could walk to just about all the attractions. Would recommend to anyone wanting somewhere close to CBD but still quiet. 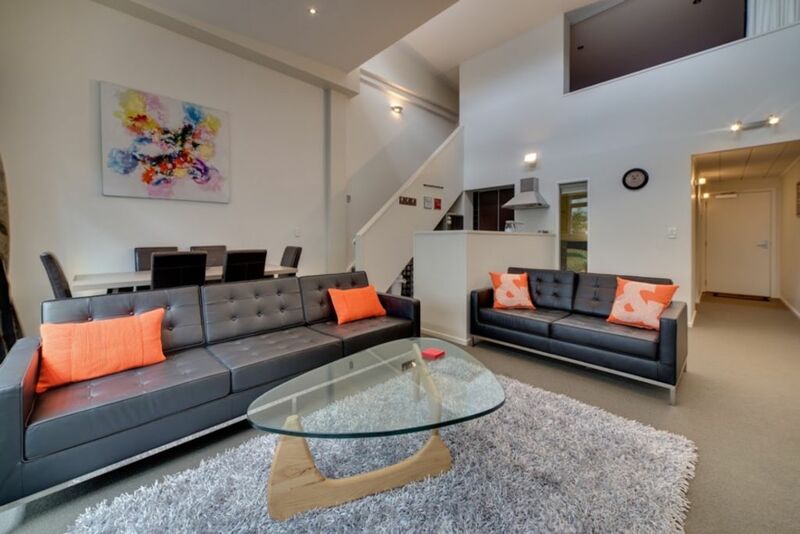 Nice modern spacious apartment and close to Cuba St.